It’s sounding again like the drought of 1976-77: “Shower with a friend.” “Put a brick in your toilet tank.” “Fix your leaky faucet.” “Replace your lawn with a cactus garden.” And then the pictures: denuded ski slopes, boat docks resting on the bottom of empty reservoirs, dry brown furrows stretching to the horizon. 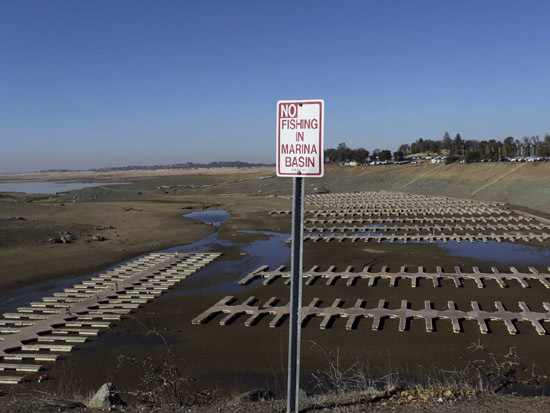 California’s water crisis derives from history, ideology, and politics. The California Constitution says that the water belongs to the people. However, farmers may take water provided they put it to “beneficial use,” first come, first served. This is the basis of California “water licenses”, which attach to pieces of land, dated to the time water was first “appropriated.” Absent any definition of “beneficial use”, this is already a recipe for waste: A “senior” water license downstream, used for low-value irrigated pasture, takes precedence over a “junior” water license upstream, used for high-value orange groves. From 1935-55, federal agencies built many dams and canals, supplementing pre-existing farm water supply on the east side of the Central Valley. The part of that federal water that was administered by the Federal Bureau of Reclamation, however, was subject to the “160-acre limitation,” restricting the amount of land entitled to nearly free water to 160 acres per landowner, and limiting the term of this giveaway to 40 years. (160 acres is a quarter of a square mile.) California’s giant landowners—some left over from 1848 when the U.S. took California from Mexico, but validated the existing Spanish and Mexican land grants—chafed under these restrictions. In the 1960’s, they found a way around it: the California State Water Project (SWP). The SWP brings water from the Feather River in the Sacramento Valley south through the long-abused Sacramento delta, then pumps it up to a canal running south along the west side of the Central Valley, pumps it up again 2000 feet over the Tehachapi mountains into Los Angeles, and conducts it even further south to San Diego. 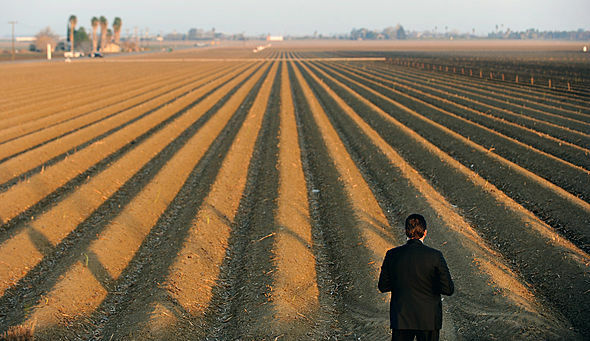 The SWP was financed by California taxpayers, frightened by claims that southern farming and then LA would dry up and blow away without an assured water supply into the 22nd Century. Meanwhile, half that water has gone to irrigate the holdings of the west side land barons. These include the J. G. Boswell dynasty (200,000 acres) and their in-laws the Chandlers (145,000 acres), at that time owners of the LA Times. The Environmental Defense Fund has proposed a “market” solution to the water problem: transform water licenses into secure and transferable property—and let the market work its wonders! This is equivalent to “cap and trade,” which gives secure “pollution rights” to polluters based on their pollution history. However “cap and trade” at least limits pollution. “Transferable water licenses” simply wouldn’t work. On the one hand, it would invite speculators to grab up water licenses and hold them by wasting water, creating an astronomical “spot market” for emergency water. On the other hand, most owners of water licenses wouldn’t sell, but would rather keep on operating the old inefficient way. “Transferable water licenses” would lock in a system under which every subsidy and giveaway engineered by pork-barrel politics becomes sacrosanct, perpetual property, and taxpayers forever incur ongoing costs of $60 per acre-foot* or more to deliver water for $3.50 per acre-foot to landowners who can resell it for $400 per acre-foot. This is the absurd, unjust sequitur of condoning private seizure of public domain. Poor perpetually-broke California, trapped by Proposition 13 and other handcuffs on its taxing power! Yet there’s liquid gold underfoot. The state could charge for water, thus recognizing that we the people own the water. Prices would depend on the region: low near the sources, and high at the end of long canals. The state could put a meter on every ground-water pump, and charge accordingly. Overnight, California’s fiscal deficit would become a surplus. Yes, some water-hogging crops like rice and hay and alfalfa might move away, as they should. That would release water for the more valuable, intensive fruit and vegetable crops for which California is famous—and which provide far more employment. The farmers might threaten to “pass on” higher water prices to consumers. But that’s an idle threat, because shifting land and water into higher-valued and more intensive crops will raise the total supply of food marketed. And when the rains come again, the reservoirs will fill and stay filled, and all the little boats will put in again. You can buy a new collection of Mason Gaffney’s essays at The Mason Gaffney Reader. *Enough water to cover an acre one foot deep.